We've been looking at historical U.S. town plans, mostly based on some type of a grid. The plan structured growth so that development followed the grid. Parks and squares were designed into this form as the primary consideration for public space and a natural relief from the urban condition. In Boston, on the other hand, centuries of expanding its isolated land mass developed haphazardly and left little room for the park. This problem was resolved by Fredrick Law Olmsted in the Emerald Necklace. In his scheme, the parks were found after the urban condition had already been established. In figure ground terms, they were leftovers. Fast forwarding to about 70 years later, the car had become the most common mode of transportation, World War II had been won, and millions of GIs were home and ready to resume life with a baby boom and houses funded by the government's gratuitous mortgage rates. It took William Levitt and his sons less than two years to capitalize on the opportunity and break ground on his first ambitious neighborhood on Long Island for 17,000 homes, named eponymously, Levittown. Much has been written about the eventual four developments that Levitt & Sons created and the countless more that were inspired by them. (This architect was raised in two.) The social impact of Levittown was profound. A few references regarding these cultural consequences are linked in the Notes below. For now, let's see what we can discern from just the plan itself. Obviously, Levittown had no grid. 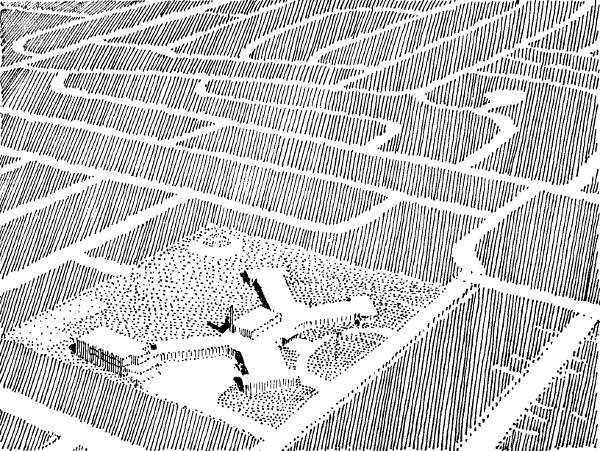 The town plan had been redefined into a weave of roads that reduced the lengths of sightlines and created random variations among homes that were very similar. Notice that no single road through the neighborhood connects to more than one main road. Shortcuts through the neighborhood to save time were discouraged by the design. Driving to nearly any home required at least one or two turns if not half a dozen or more. 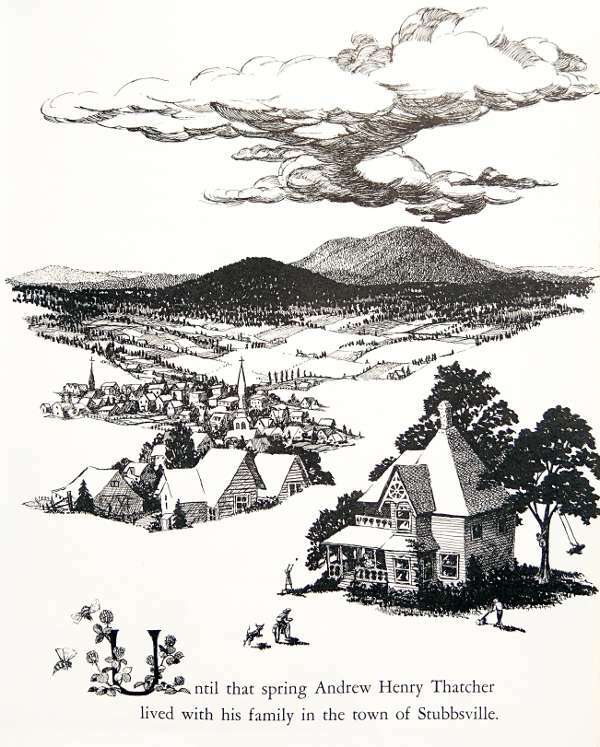 Instead of a town center, the neighborhood was not connected to the rest of humanity other than via highway. Like a commune, the weave implied a more inward focus and fenced off outsiders. At the same time, new technologies in the car, radio, telephone, and television connected citizens more abstractly instead of face-to-face on the community's streets. 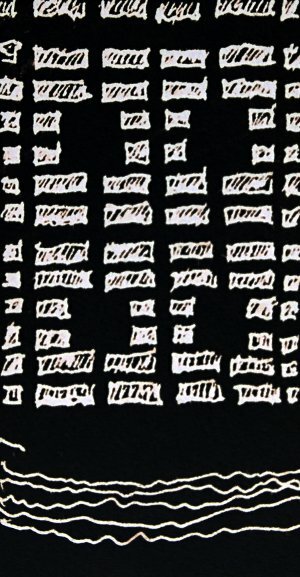 Visual connections were minimized in favor of more abstract ones. Even internally within the neighborhood, spacial connections were less formal. Houses never faced each other directly across a street. Neighboring lots were usually oblique at the front face to some degree and angular next door. The occasional school or park was circuitously secluded as far from the main roads as possible. Test this in the map above. How many turns does it take to get from the main road to the school in the center? Planning like this reduced outsider use of parks since the were difficult to find. Theoretically, this also increased the neighborhood's sense of ownership. But the same design disconnected the larger community and its services, like police, fire department, school buses, and even the residents themselves. The developer's offices on the outskirts had to help new residents find their homes several times a day! Clearly, the most important thing to the Levitts was the maximization of lots along roads that could easily be appended and woven around minor obstructions like retainage ponds, power lines, and existing motorways. You can see directly in the plan that financial interests outweighed any other social or community ones. This certainly made economic sense for the developer since no one would pay for any unsold areas. But compared to Savannah, Levittown and its imitators made obvious sacrifices of public space and parklands for thousands of residential units and private yards. Would you expect the developer, with the primary financial interest in success, to have a romantic view of the planned neighborhood? 1. The Long Island Motor Parkway, by Howard Kroplick and Al Velocci, Vanderbilt Cup Races. 2. Levittown: The Imperfect Rise of the American Suburbs, by Crystal Galyean. 3. Levittowners, a site dedicated to Levittown, Pennsylvania. This entry was posted in Figure Ground, Sketch, Town Planning and tagged Levittown, sketch, suburbia, urban planning on 2016-01-18 by Steve Hall. In Manhattan, we saw the visual impact of Frederick Law Olmsted's expansive, 778 acre Central Park. When he came to Boston, the original Boston Common, established near the beginnings of the peninsula's settlement, was only 50 acres. Boston's fills had leveled its hills into its bays to grow landmass. The result was an ever stagnating water flow from the rivers that fed these bays. Olmsted's challenge was to create a larger, more interesting park. But a single, rectangular park would not be possible in Boston due to the irregular growth pattern. Although the Back Bay had a regular pattern like New York, it had already been developed with buildings. The genius of Olmsted's idea was to use the restoration and revitalization of the rivers and marshes as the parks themselves. This, in a city that had leveled its natural hills to fill its natural waterways! Beginning about 1878, Olmsted finalized a design to link the original Boston Common with the large 527 acre Franklin Park (both in forest green). A long necklace of parks was developed as a series of varied emeralds totaling 1,100 acres. Through the Public Garden adjacent the Common, a great parkway was created as the central avenue through the even grid of the back bay (orange) adjacent the Charles River (blue). Then, a long, varied park system (yellow) would meander along the Muddy River from the Fens1 to Jamaica Pond, the Arboretum, and a tree-lined roadway connection to Franklin Park. Although not a singular recognizable form in the figure of Boston like Central Park stood in Manhattan, the resulting park reflected a similar variation of scenes, distinct moods, and landscape features strung through the city. 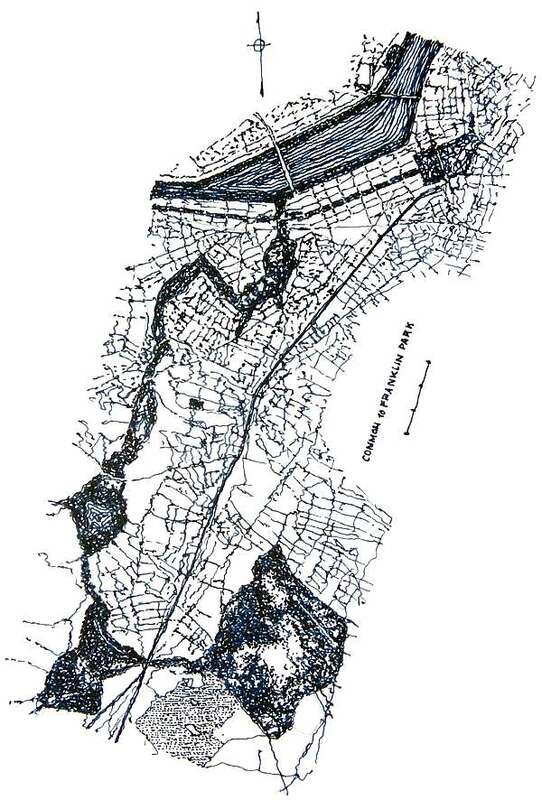 In their course, the Emerald Necklace also successfully managed storm and wastewater and revitalized severely weakened marshes. The strategy seems like such an obvious solution to the problem. But at a time just after the Civil War, when the country had barely conquered steam power and the electric light bulb, Olmsted's ideas were a challenge to the industrialized mindset of the country. 1. Softball question: Any guesses to what major league sports park would be located beside a path through the Fens? 2. There is a good one-hour documentary on Olmsted you can watch online for free at the PBS.org page dedicated to it: Frederick Law Olmsted: Designing America. The particular segment on Boston begins at 42:12, but watch the whole piece for connections in Olmsted's work to Central and Prospect parks, Buffalo, parkways, Tacoma, and the Biltmore House. This entry was posted in Figure Ground, Sketch, Town Planning on 2015-12-15 by Steve Hall. This is an article in the middle of a series on figure ground studies. Currently, we're looking at large scale developments, namely cities, to understand how relationships of space and form can be manipulated to achieve design goals. Previously, Savannah was noted for its planned developmental pattern around a concept of smaller units, called wards. The city of Boston is a great study in contrast to Savannah because it was developed without a central plan. Boston grew out of need for defense and in response to geographical and cultural interests for trade. It is unique because of its centuries of earthmoving in vast areas surrounding the original town. Born as the defensible Shawmut Peninsula about 1630, a single road crossed the isthmus into the town through fortifications. A second road across the opposite neck to Copps Hill intersected the first in the center of a settlement of church, government, and trade. 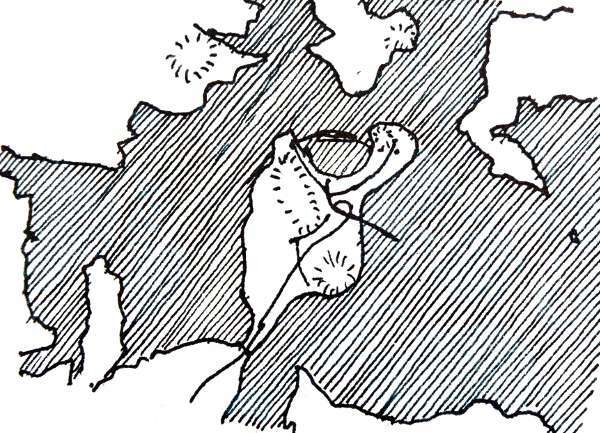 Before long, warfs began extending from the seaward edges. One, named "Long Warf," was fully a third of a mile long created to bridge out into deeper water for the largest ships. 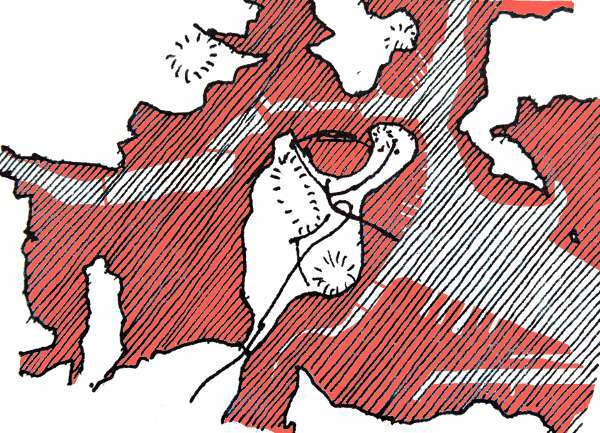 The crowded peninsula quickly began to grow through warfs and solid landfills (diagrammed in red). Its five hills, once advantageous for defense, were leveled and used as material to fill the adjacent water. By 1880, numerous bays had been filled. This entry was posted in Figure Ground, Sketch, Town Planning on 2015-12-14 by Steve Hall. 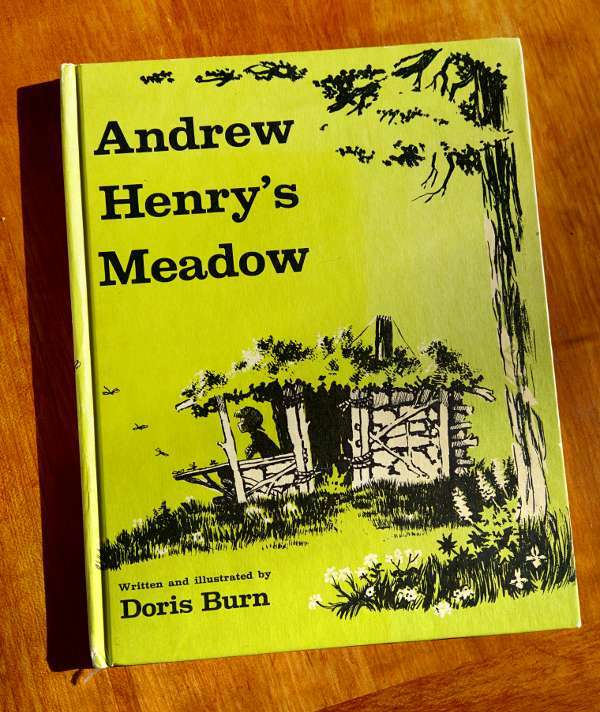 My favorite childhood book was, and still is, Andrew Henry's Meadow, by Doris Burn. To the right is the Weekly Reader copy I've had since the 1970's--you need to buy it for your young architect! It's the compelling story of a child inventor and builder unappreciated by his family and determined to strike out on his own. 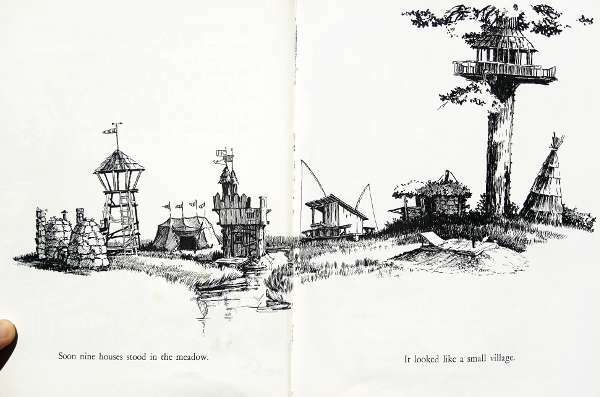 To a child, this book illustrated facinating possibilities in building places that were personal. Each was perfectly sited, scaled, and suited to it's owner. Little did I know, the book would become a key ingredient in propelling me toward architecture. Let me share a few photos of my book's pages. The story is about Andrew Henry, and his building projects that eventually overwhelm his family's tolerance. So he decides to set out and build elsewhere. One by one, his friends, with their unique interests, do the same and join him in a distant meadow. Andrew Henry constructs houses suitable to each's interests in what becomes a small village. Just look at these illustrations! There are over 30 in the book, cleverly woven along the pages and words. Doris Burn was not an architect, but her drawings are classic architectural renderings. In black and white, they had a simplicity that seemed a possibility for a young man with a pencil. Soft edges, contrasting fore and backgrounds, proper perspective, and the sketchy but realistic nature of the story seem very real. Yet there is a imperceptibly cartoon nature to each one. Sometimes the houses are a bit out of proportion or level. Sometimes natural plant features, people, or animal forms are slightly exaggerated. In a friendly, approachable manner, Burn contemplates the very serious maturation in growing up. Supposedly this is just a child's book, but a young architectural student would do very well to represent such clear notions of an architectural idea. Each child's interest is clearly but cleverly represented in his or her home. I think this is what makes the book so compelling. Who doesn't imagine a home ideally suited to their passions, tastes, and preferences? Great architecture is expressive. Andrew Henry's Meadow faithfully represents childhood intrigue the same way adults imagine places for impassioned living, creative work, exotic dining, or inspired worship. The book also fairly represents considerations for situating each house on the land so that its interests are best fulfilled. 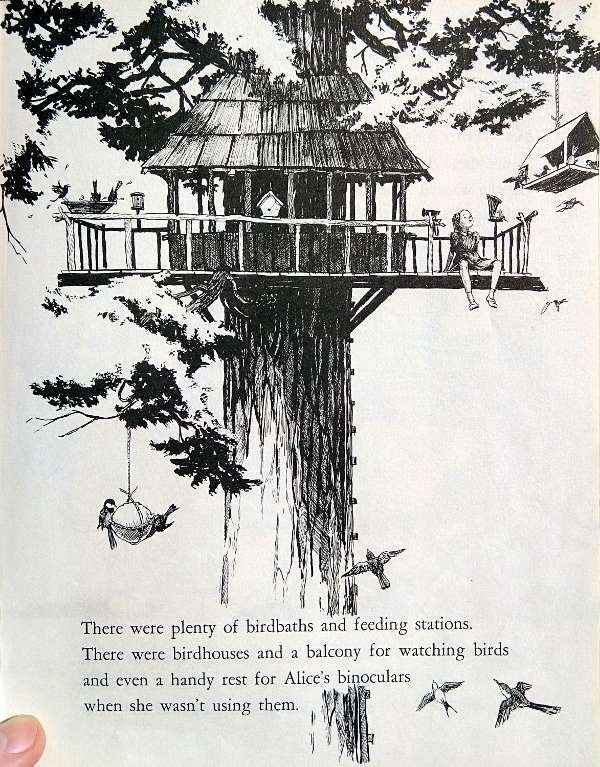 For example, Alice's house is high within a tree because she likes birds. She doesn't just look at them from a far. Her home is submerged in the very environment she relishes. Other children's homes are underground, in a castle with a moat, or on a fishing bridge. Andrew Henry's own home is a mature place of repose to observe the peace of the meadow and his friends. This is a book I still page through at least once a year. I know that there are staggering amounts of full color books and ever-flashing multi-media entertainments at children's thumb tips these days. 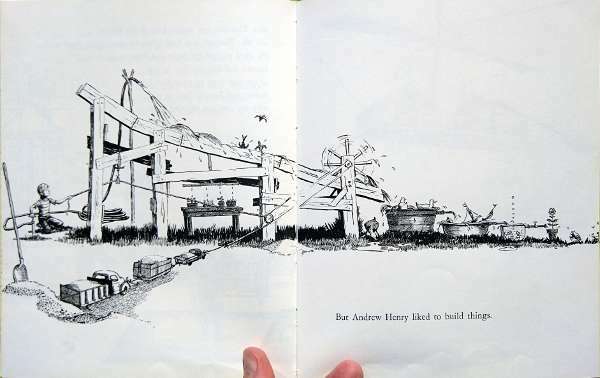 But I think the elegant, hand-crafted simplicity of Andrew Henry's Meadow is a unique inspiration for fostering the tangible creativity and rational exploration that children need. This entry was posted in Sketch, Town Planning on 2015-12-11 by Steve Hall. In previous sketches, we looked at Figure Ground and the city plans of Manhattan, Philadelphia, and Raleigh. Particularly, these cities were structured around parks and streets as public rooms. Savannah was also structured around parks, but with one addition. 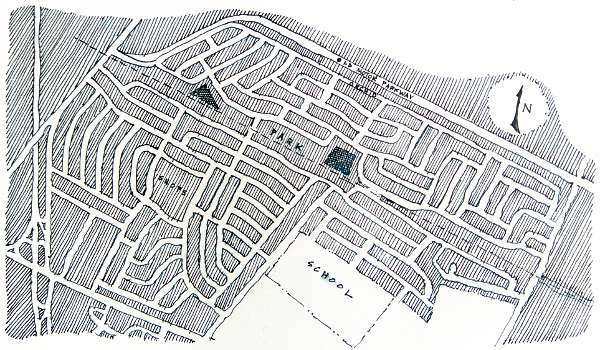 In James Oglethorpe's 1730 plan, the form was considered a replicating pattern of neighborhoods. It was not simply a finished, completed city plan. 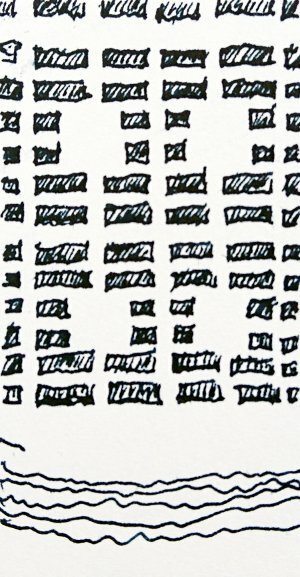 It was more than a simple, abstract grid. Oglethorpe created wards as the fundamental unit in his plan of Savannah. Each was a central open square enclosed by a balance of public and private lots. This grouping of properties was linked to corresponding farming areas outside of the city so that agricultural sizes were directly associated with urban ones. Within a single ward, tything lots of ten were arranged with houses facing the street, their back yards abutted along a small access alley. Each grouping of ten houses had a half-size trust lot intended for civic buildings. In this design, the basic proportion of park to private dwellings was approximately 1:4. As you can see in the diagram, the park was balanced to public property by their adjacency. This allowed adjustments to be made between the two without affecting the residential blocks. Wards represented the city's smallest unit of neighborhood. It was a clear visualization of relationships and interdepencies for help and defense. Oglethorpe aspired to a design that was equitable and egalitarian. The grid implied a democratic structure. But emphasizing the common person as a central building block within the grid meant that no governor could gain a higher advantage or position than anyone else. 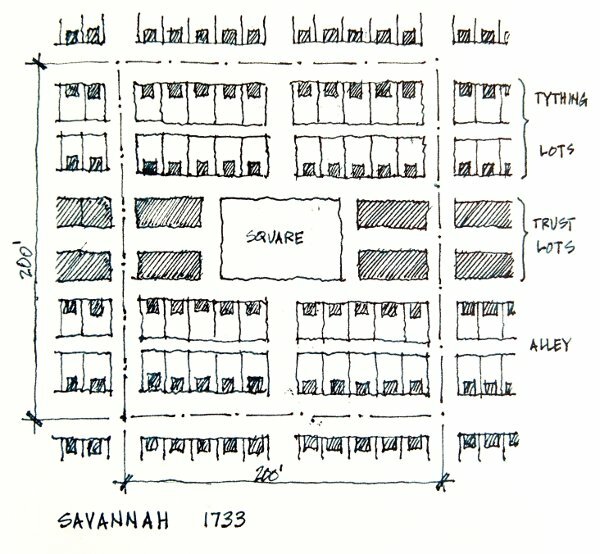 Although Manhattan's grid implied extensible growth, Savannah's plan 180 years earlier added a higher order of organic, sustainable groupings without a theroetical limit. The result was smaller scale livable clusters that still hold charm today. From the original four, a total of 24 wards were eventually created, most of which are essentially visible in the map of Savannah today, almost 300 years later. For more information, you can find several excellent articles on Wikipedia's Oglethorpe Plan and Squares of Savannah, Georgia for more details. Plenty of diagrams for Savannah's plan can be found through Google image search "savannah oglethorpe plan"
Next, we'll take a look at the development of a third major city during the time of America's founding. This entry was posted in Figure Ground, Sketch, Town Planning on 2015-12-11 by Steve Hall.